Being in Texas sometimes means I get access to things Houston and Dallas related a little quicker. A buddy down south gave me word earlier today that a TV station in Houston would have renderings of the new Dynamo stadium in their evening broadcast. Sure enough they came through on their word. Below are two snapshots I got out of the video, which can be seen here. 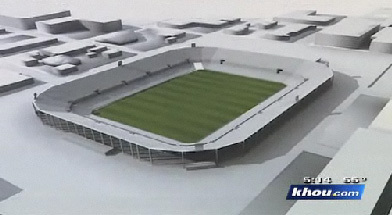 Its a bit early in what the stadium will actually look like but it sure beats not having a deal at all. The stadium looks like the one from Miami where Miami Barcelona wants to play, except i guess with a roof. In this world of copy cats or i can do better after you do something on the good way, not the bad of way of jealousy. You guys get me…………. 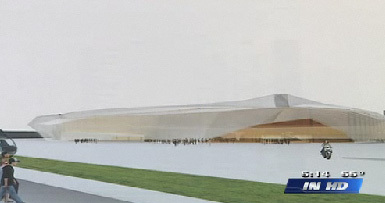 Houston can do better, dont design a stadium for football but for soccer, YESSSSSSSSSSSSSSSSSSS. Don't build a 20-21k stadium, build a 30-31k stadium. You already get 30k out to your games at the University of Houston. With a stadium downtown, you'll have a huge demand for the 30k seats. Don’t build a 20-21k stadium, build a 30-31k stadium. You already get 30k out to your games at the University of Houston. With a stadium downtown, you’ll have a huge demand for the 30k seats. A 20,000 – 21,000 capacity stadium would be ideal as the average a little over 17,000 fans a regular season game. There is no greater atmosphere killer than looking out at 13,000+ empty seats. Granted those seats would be filled in playoff situations, but 1-4 games in a 30+ game season doesn't warrant the cost and upkeep of the other 10,000 seats. A cheaper solution would be a few standing room areas in which some seats may be added to accommodate a larger playoff attendance. 30,972 [11/10/07] HOU. vs. K.C. 30,588 [10/07/07] HOU. vs. L.A.
30,361 [10/18/08] HOU. vs. L.A.
30,088 [11/02/07] HOU. vs. DAL. 30,053 [11/09/08] HOU. vs. N.Y.
A 20,000 – 21,000 capacity stadium would be ideal as the average a little over 17,000 fans a regular season game. There is no greater atmosphere killer than looking out at 13,000+ empty seats. Granted those seats would be filled in playoff situations, but 1-4 games in a 30+ game season doesn’t warrant the cost and upkeep of the other 10,000 seats. A cheaper solution would be a few standing room areas in which some seats may be added to accommodate a larger playoff attendance.